KENT MARINE PRO-DECHLORINATOR can be used directly in freshwater or marine aquariums to neutralize chlorine, chloramines and heavy metals many water departments treat water. It is safe for both hard and soft corals as well as marine fish and other invertebrates. 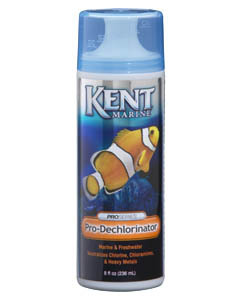 Kent Marine Pro-Dechlorinator does not contain a slime coat protector that can interfere with protein skimming.